Sizes: | S - 3XL, 5XL Size Guide | Fabric: | BIZ COOL Breathable 92% Polyester, 8% Elastane Stretch Fabric: 130 GSM | Features: | Quick dry Fabric: with mesh panels for added breathability Reflective visability tape leg feature Built-in quick drying mesh Fabric: briefs reduces chaffing No twist elastic waist with internal soft drawcord Internal key fob pocket Available in Black and Navy only. Product Materials: Elastane | Polyester. Colours: Black. Colours: Navy. Product Sizes: S | M | L | XL | 2XL | 3XL | 5XL. Sizes: | XS - 2XL Size Guide | Fabric: | BIZ COOL Breathable 92% Polyester, 8% Elastane Stretch Fabric: 130 GSM | Features: | Quick dry Fabric: with mesh panels for added breathability Reflective visability tape leg feature Built-in quick drying mesh Fabric: briefs reduces chaffing No twist elastic waist with internal soft drawcord Internal key fob pocket Available in Black and Navy only. Product Materials: Elastane | Polyester. Colours: Black. Colours: Navy. Product Sizes: XS | S | M | L | XL | 2XL. Sizes: | 4-6, 8 - 16 Size Guide | Fabric: | BIZ COOL Breathable 92% Polyester, 8% Elastane Stretch Fabric: 130 GSM | Features: | Quick dry Fabric: with mesh panels for added breathability Reflective visability tape leg feature Built-in quick drying mesh Fabric: briefs reduces chaffing No twist elastic waist with internal soft drawcord Internal key fob pocket Available in Black and Navy only. Product Materials: Elastane | Polyester. Colours: Black. Colours: Navy. Product Sizes: 6 | 8 | 10 | 12 | 14 | 16. Sizes: | 10 - 26 | EVE IS THE PERFECT PANT FOR YOU IF: | you often find pants gaping at the waist you need more room through the seat and thigh you want a flattering cut for your hourglass or pear shape | Fabric: | 4-way Stretch Comfort 62% Polyester, 34% Viscose, 4% Elastane | Features: | Mid-rise with a flattering wider waistband Low profile front and back pockets Classic straight leg shape Finished inseam length: 82cm. Product Materials: Polyester | Viscose | Elastane. Colours: Black. Colours: Navy. Product Sizes: 10 | 12 | 14 | 16 | 18 | 20 | 22 | 24 | 26. 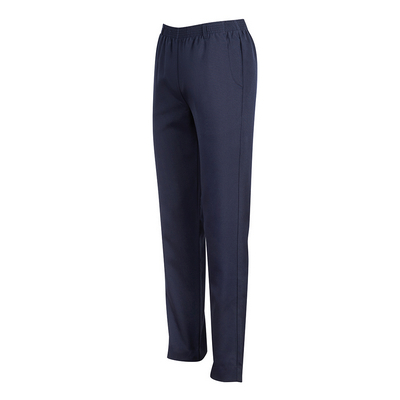 Sizes: | 4 - 16 | KATE IS THE PERFECT PANT FOR YOU IF: | you find pants fit at the waist but are too loose at the hip you have a slimmer thigh you have a petite or slender build | Fabric: | 4-way Stretch Comfort 62% Polyester, 34% Viscose, 4% Elastane | Features: | Mid-rise with a flattering wider waistband Low profile front and back pockets Classic straight leg shape Finished inseam length: 82cm. Product Materials: Polyester | Viscose | Elastane. Colours: Black. Colours: Navy. Product Sizes: 4 | 6 | 8 | 10 | 12 | 14 | 16. Sizes: | 6 - 26 Size Guide | Fabric: | 98% Cotton, 2% Elastane stretch Fabric: 250 GSM | Features: | Garment washed for a soft lived-in feel Comfortable modern mid-rise fit Flat front with tapered leg styling 2 Side angled pockets, 2 back welt pockets | Colours: | Available in Navy or Dark Stone. Product Materials: Cotton | Elastane. Colours: Black. Colours: Navy | Dark Stone. Product Sizes: 6 | 8 | 10 | 12 | 14 | 16 | 18 | 20 | 22 | 24 | 26. Sizes: | 72R - 127R Size Guide | Fabric: | 98% Cotton, 2% Elastane stretch Fabric: 250 GSM | Features: | Garment washed for a soft lived-in feel Comfortable modern mid-rise fit Flat front with tapered leg styling 2 Side angled pockets, 2 back welt pockets | Colours: | Available in Navy or Dark Stone. Product Materials: Cotton | Elastane. Colours: Black. Colours: Dark Stone | Navy. Product Sizes: 72 | 77 | 82 | 87 | 92 | 97 | 102 | 107 | 112 | 117 | 122 | 127. Sizes: | S - 3XL, 5XL Size Guide | Fabric: | 100% BIZ COOL Micro Polyester, with durable resin finish 155 GSM UPF rating - Excellent | Features: | Silver reflective trims for visibility Stretch knit Fabric: allows maximum range of movement Flat seams and soft elastic waistband for anti-chaffing comfort Secure zippered side pocket. Product Materials: Polyester. Colours: Grey | Black. Colours: Navy. Product Sizes: S | M | L | XL | 2XL | 3XL | 5XL. Sizes: | 46 - 16 Size Guide | Fabric: | 100% BIZ COOL Micro Polyester, with durable resin finish 155 GSM UPF rating - Excellent | Features: | Silver reflective trims for visibility Stretch knit Fabric: allows maximum range of movement Flat seams and soft elastic waistband for anti-chaffing comfort Secure zippered side pocket. Product Materials: Polyester. Colours: Grey | Black. Colours: Navy. Product Sizes: 6 | 8 | 10 | 12 | 14 | 16. Sizes: | 72R - 102R Size Guide | Fabric: | 65% Polyester, 35% Viscose - easy care Fabric: Mechanical stretch for added comfort | Features: | Contemporary flat front with 2 side pockets, 1 back welt pocket Generous seams and 5cm hem allowance for longer length alteration Coordinates with Mens Classic range | Colours: | Available in Black or Navy. Product Materials: Polyester | Viscose. Colours: Black. Colours: Navy. Product Sizes: 72 | 77 | 82 | 87 | 92 | 97 | 102. Sizes: | 4 - 30 Size Guide | Fabric: | 65% Polyester, 35% Viscose - Teflon stain resistance Fabric: Durable, easy care Fabric: | Features: | Unique Flexi-band feature maximises waist comfort and fit Flat front with 2 angled pockets, 2 back welt pockets Generous 5cm hem allowance for longer length alteration. Product Materials: Polyester | Viscose. Colours: Black. Colours: Navy. Product Sizes: 4 | 6 | 8 | 10 | 12 | 14 | 16 | 18 | 20 | 22 | 24 | 26 | 28 | 30. Sizes: | 4 - 26 Size Guide | Fabric: | 4-Way Stretch 62% Polyester, 34% Viscose, 4% Elastane Machine washable, crease resistant, easy care Fabric: | Features: | Created due to popular demand for a slim leg silhouette Mid-rise, zip front with slimline waistband No side pockets or belt loops creates a clean sleek appearance at waist and hips Added 5cm hem allowance for longer alteration Coordinates with our best-selling Perfect Pant Range. Product Materials: Polyester | Elastane | Viscose. Colours: Black. Colours: Navy. Product Sizes: 4 | 6 | 8 | 10 | 12 | 14 | 16 | 18 | 20 | 22 | 24 | 26. Sizes: | 6 - 24 Size Guide | Fabric: | 98% Cotton, 2% Elastane stretch Fabric: Unique jacquard weave cloth made with stretch for added comfort 215 GSM | Features: | Modern mid-rise fit caters to majority of body types Flat front with tapered leg styling 2 Side angled pockets 5cm hem allowance for longer length alteration. Product Materials: Cotton | Elastane. Colours: Grey. Colours: Navy. Product Sizes: 6 | 8 | 10 | 12 | 14 | 16 | 18 | 20 | 22 | 24. Sizes: | 72R - 127R Size Guide | Fabric: | 98% Cotton, 2% Elastane stretch Fabric: Unique jacquard weave cloth made with stretch for added comfort 215 GSM | Features: | Modern mid-rise fit caters to majority of body types Flat front with tapered leg styling 2 Side angled pockets, mens style also Features: 2 back welt pockets 5cm hem allowance for longer length alteration. Product Materials: Cotton | Elastane. Colours: Grey. Colours: Navy. Product Sizes: 72 | 77 | 82 | 87 | 92 | 97 | 102 | 107 | 112 | 117 | 122 | 127. Sizes: | XS - 2XL Size Guide | Fabric: | Black, Navy: 65% Polyester 35% Cotton Grey Marle: 50% Polyester 45% Cotton 5% Viscose Premium double faced interlock Fabric: | Features: | Luxury Fabric: feels soft against the skin Open side pockets for easy access Ergonomic fit allows natural motion Ladies feature non-ribbed hem for a clean, streamlined fit. Product Materials: Cotton | Viscose | Polyester. Colours: Black. Colours: Grey Marle | Navy. Product Sizes: XS | S | M | L | XL | 2XL. Sizes: | XS - 3XL Size Guide | Fabric: | Black, Navy: 65% Polyester 35% Cotton Grey Marle: 50% Polyester 45% Cotton 5% Viscose Premium double faced interlock Fabric: | Features: | Luxury Fabric: feels soft against the skin Open side pockets for easy access Ergonomic fit allows natural motion Mens feature relaxed shape with knitted hem and cuff. Product Materials: Cotton | Viscose | Polyester. Colours: Black. Colours: Grey Marle | Navy. Product Sizes: XS | S | M | L | XL | 2XL | 3XL. 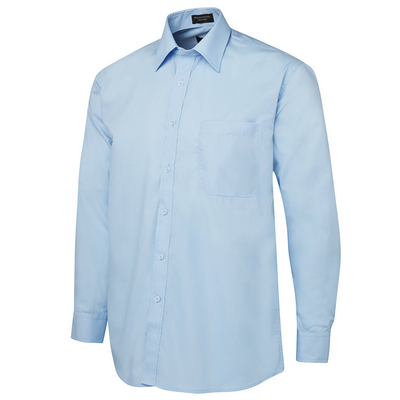 Classic and stylish, this classic fit shirt is made from 100% cotton for 100% comfort. Relaxed Corporate Wear. Detais: 55% Cotton for comfort, 45% Polyester for durability, cotton richfine chambray fabric, two piece collar and collar stand, bust and waist darts for shaping, curved hem with side splits, easy care fabric, individually packed in JBs logo bag with fit measurement guide. Colours: Lt Blue | Lilac | Indigo. Sizes: 6 | 8 | 10 | 12 | 14 | 16 | 18 | 20 | 22. Enjoy the easy casual comfort of these urban fit Fleecy Sweat Pants. Casual comfort. Detais: 65% Polyester for durability and 35% Cotton for comfort, Open bottom hem, and elastic waist with inner drawstring for adjustability. Two Side Pockets, Knee patch for Kids sizes 4-15. Colours: Black | Bottle | Navy | Royal | . Sizes: 4 | 6 | 8 | 10 | 12 | 14 | . 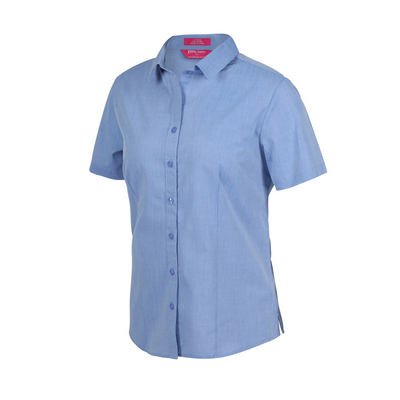 Perfect for school uniforms, this classic fit shirt has customary features to keep everyone happy. Essential school shirt. Detais: 65% Polyester 35% Cotton Poplin, Classic fit with Flat collar, Reinforced front chest pocket, Straight hem with side splits, Easy care fabric, Individually packed in JBs logo bag with fit measurement guide. Colours: White. Sizes: 4 | 6 | 8 | 10 | 12 | 14. 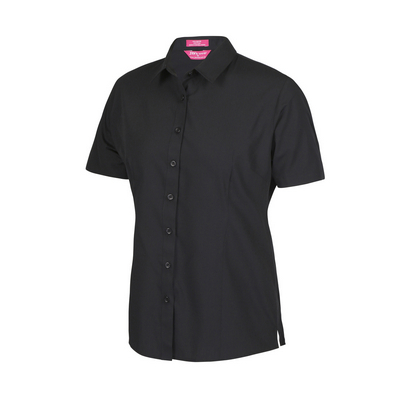 Matching the mens, this ladies version is a perfect addition to your corporate wardrobe, Classic fit, style and comfort. Classic comfort. Detais: 65% Polyester for durability, 35% Cotton for comfort, Two piece collar and collar stand, Reinforced chest pocket, Straight hem with side splits - longer length, Individually packed with JBs logo bag with fit measurement guide. Colours: White. Sizes: 8 | 10 | 12 | 14 | 16 | 18 | 20 | 22. Matching the mens, this ladies version is a perfect addition to your corporate wardrobe, Classic fit, style and comfort. Classic comfort. Detais: 65% Polyester for durability, 35% Cotton for comfort, Two piece collar and collar stand, Reinforced chest pocket, Straight hem with side splits - longer length, Individually packed with JBs logo bag with fit measurement guide. Colours: Black | White. Sizes: 8 | 10 | 12 | 14 | 16 | 18 | 20 | 22. 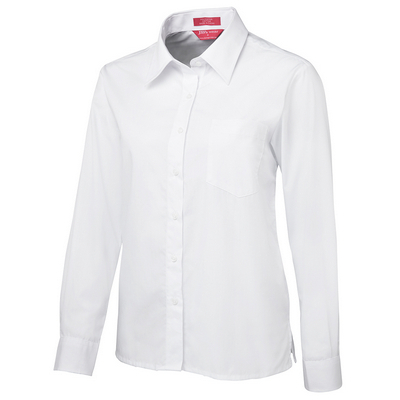 From conference to classroom, this easy-to-wear shirt features clean lines for a polished look. Classic everyday comfort. Detais: 65% Polyester for durability, and 35% Cotton poplin for comfort, Original fit, Two-piece collar and collar stand, Chest pocket, Double back yoke with two inverted pleats, Curved hem with traditional back tail, Easy care fabric, Individually packed in JBs logo bag with fit measurement guide. Colours: Black | Lt Blue | White | Charcoal. Sizes: S | M | L | XL | 2XL | 3XL | 4XL | 5XL. 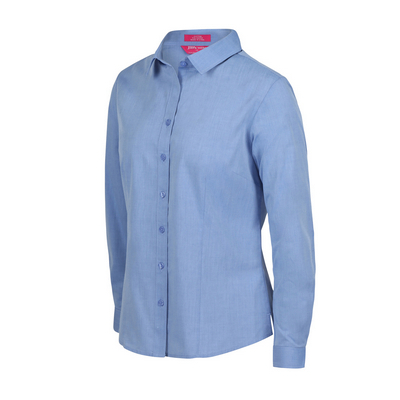 This easy-to-wear shirt features clean lines for a polished look. Classic School Style. Detais: 65% Polyester for durability, and 35% Cotton poplin for comfort, Two-piece collar and collar stays, Chest pocket, Double back yoke with two inverted pleats, Curved hem with traditional back tail, Easy care fabric, Individually packed in JBs logo bag with fit measurement guide. Colours: Lt Blue | White. Sizes: 4 | 6 | 8 | 10 | 12 | 14. 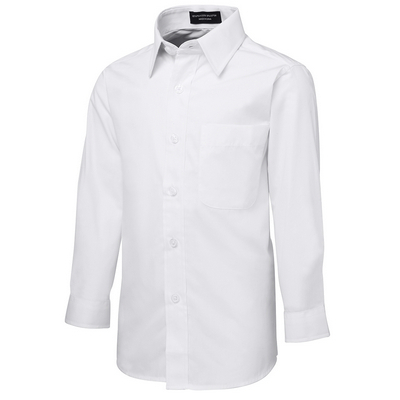 A perfect every day wear shirt for school, cut to a classic fit. School Styling. Detais: 65% Polyester for durability, and 35% Cotton poplin for comfort, Two-piece collar and collar stays, Chest pocket, Double back yoke with two inverted pleats, Curved hem with traditional back tail, Easy care fabric, Individually packed in JBs logo bag with fit measurement guide. Colours: Lt Blue | Lt Blue | White | White. Sizes: 4 | 6 | 8 | 10 | 12 | 14. 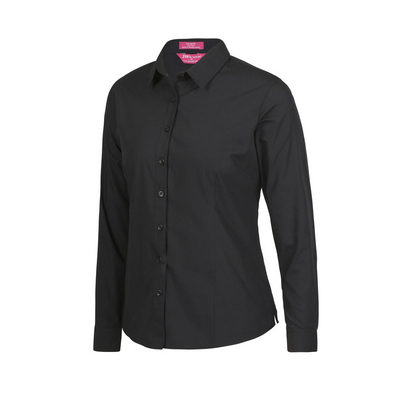 Perfect for everyday corporate wear, this ladies shirt is cut to a classic fit and finished with bust and waist darts for shaping. Wear it well. Detais: 65% Polyester for durability, 35% Cotton for comfort, two piece collar and collar stand, bust and waist darts for shaping, curved hem with side splits, individually packed in JBs logo bag with fit measurement guide. Colours: Black | White. Sizes: 4 | 6 | 8 | 10 | 12 | 14 | 16 | 18 | 20 | 22.